Within the scope of the bill of specifications, this variety is only cultivated on the island and nowhere else, and it’s the flagship of our spring potato varieties. You can find the Alcmaria on the market every year from mid april. In the early season, its thin skin crumble and is almost transparent. Its flesh melts in the mouth and its taste is unique. This potato is delicious when steamed. 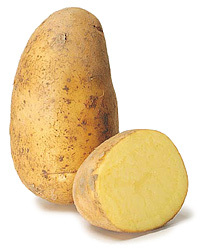 This potato with character can be found from mid may until the end of the season in late june. It has both a beautiful appearance and amazing gustatory qualities. 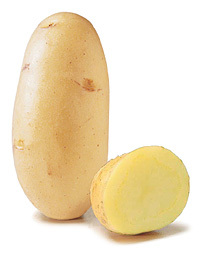 Its yellow and firm flesh allows you to cook it however you want and will be perfect for any kind of culinary fantasy. This variety has a nice long shape. With its yellow and firm flesh, it cooks very well and it also stays fresh longer than the other varieties.